The FBI is withholding at least another 84 surveillance tapes that were seized in the immediate aftermath of the attack on the Pentagon. There is an ongoing lawsuit to get these tapes released via the Freedom of Information Act. 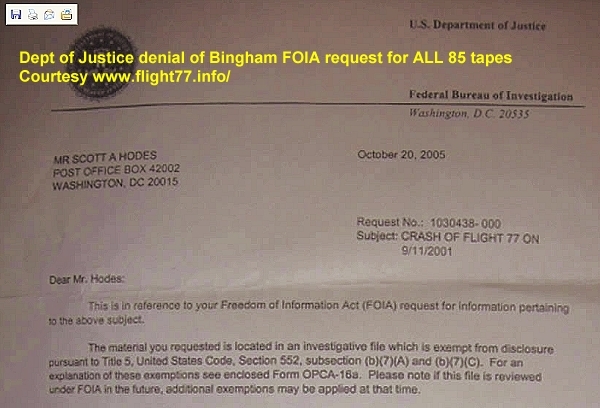 The FBI has admitted in a statement to attorney, Scott Hodes, representative of Mr Scott Bingham who runs the website http://www.flight77.info/, that they have these tapes, that they have already analyzed them and are still keeping them under lock and key. 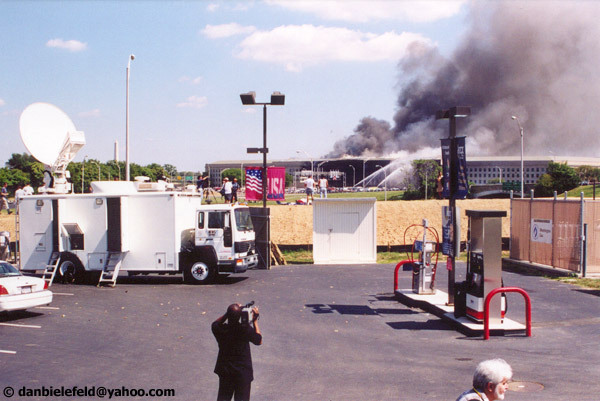 A great deal of speculation has surrounded reports that on the morning of september 11th, 2001 the FBI visited two private businesses near the pentagon and confiscated several security camera video tapes. The first is said to be the Cigto gas station with several security cameras aimed in the direction of the pentagon. Flight 77 flew directly over the gas station at an altitude of roughly 50 feet, less than 3 seconds from impact. Three months after 9/11 The National Geographic and others reported on this, publishing short interviews with the gas station owner, Jose Velasquez. "His gas station, open only to Department of Defense personnel, is the last structure between the Pentagon and the hillside that, hours later, would become a wailing knoll. "By the time I got outside all I could see was a giant cloud of smoke, first white then black, coming from the Pentagon," he said. "It was just a terrible, terrible thing to be so close to." "Velasquez says the gas station's security cameras are close enough to the Pentagon to have recorded the moment of impact. "I've never seen what the pictures looked like," he said. "The FBI was here within minutes and took the film." The second business was initially believed to be the Sheraton National Hotel which overlooks I395 and the Pentagon. Initial reports pointed out that hotel staff had sat watching the video surveillance in horror before the FBI arrived and shut down the scene. If this is the case then why did the FBI confiscate the gas station and hotel security videos within minutes of the crash and why haven't they subsequently released these videos? MCINTYRE (on camera): These pictures are the first to be made public, but they are not the only images of the plane hitting the Pentagon. Sources tell CNN that the FBI on September 11th confiscated a nearby hotel's security camera videotape, which also captured the attack. So far, the Justice Department has refused to release that videotape. Aaron. BROWN: Why? Do we have any idea why they won't release it? MCINTYRE: Well, the claim - we have filed a freedom of information request for it. They claim that it might provide some intelligence to somebody else who might want to do harm to the United States. But officials I talked to here at the Pentagon say they don't see any national security or criminal value to that tape. The FBI tends to hold on to things. But the government may eventually release that tape, and if they do, we'll bring it to you. BROWN: Jamie, thanks. I must have missed something in how, where the intelligence possibilities are there, but that happens with me sometimes. Thank you for your work today, nice job. Whichever story you believe, whether the footage does or does not show the impact, the fact that the footage exists is not denied. So something does not tally up here. Both FOIA requests were denied yet we have one FOIA request denial saying the footage does not show the impact, yet a second FOIA request denial saying it does show the impact. Furthermore, if the footage does not show the impact, we have to ask the question why is the Justice department still withholding it under national security laws? Now the trial of Zacarious Moussaoui is over, this can also no longer be cited as reason to keep footage under wraps, as was proven yesterday with the release of the extended grainy film to Judicial Watch. According to the FBI 7 page Maguire statement, of the 85 confirmed tapes seized, only the one released yesterday shows the impact. How unlikely is it that out of another 84 confirmed surveillance tapes directed at the building, none of them captured anything? After determining that only 13 of the 85 had footage of the crash site, the FBI states that 12 of these only show footage AFTER the impact of flight 77. WHY? Did someone forget to turn them on? ALL TWELEVE OF THEM? Furthermore how unlikely is it that in Washington DC there were only 13 cameras pointing in the general direction of the most surveilled building in the world? The area is littered with buildings and roads that have their own surveillance systems, in addition to the pentagon itself - does the sole world superpower's military HQ only have a couple of cameras at the front gate? You can even view live feeds of footage from the Pentagon online right now. 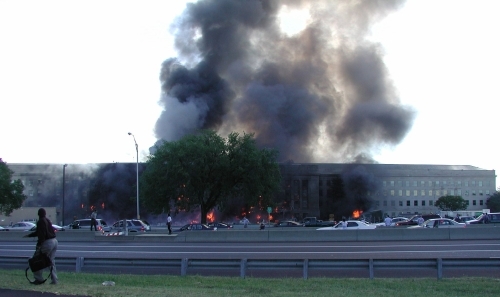 The Virginia Department of Transportation (VDOT) CCTV system used to manage the Northern Virginia freeway network had cameras in place that observed the September 11 crash site at the Pentagon. This CCTV system and the VDOT Smart Traffic Center were used as a command center for emergency responders and cleanup and recovery crews following the incident. The reason given for the fact that these cameras did not get the impact is because there was no film in them. "No one can say for sure why the FBI is reluctant to release the videos. it could just be a matter of policy, or it could have to do - as many suspect - with the notion that keeping the videos from the public is helping to fuel wild conspiracy theories. these theories - that no 757 hit the pentagon - helps discredit the 9/11 truth movement in general, and keeps people's focus away from such topics as WTC building 7." We are in agreement with Mr Bingham. For over four years we at Infowars and Prisonplanet have remained neutral on the subject of flight 77, agreeing that unanswered questions need to be explored but warning against the Pentagon issue becoming the core focus of the 9/11 truth movement. The danger is clearly that the government will use its media mouthpieces in particular Fox News to hype this until it becomes the de facto keystone of alternative explanations behind 9/11. At the point when that crescendo reaches its peak crystal clear footage of Flight 77 hitting the Pentagon will be released, knocking down the straw man argument that the establishment itself erected. We need to concentrate on the concrete facts that point towards a cover up of complicity and not on wild speculation that will only hinder the movement as a whole.